The history of jewellery in India dates back to pre-historic times about 5,000 years ago. Jewellery was manufactured in India in different shape and style depending upon the area of their manufacture. In fact gold was designed for each and every part of the body. This requires high versatility and expert craftsmanship. In ancient times kings and maharajas had a virtual monopoly over the yellow metal. The jewellery, especially the gold came under their prerogative and the kings and maharajas vied with each other to make and own the exclusive variety of gold to be under their sole possession. 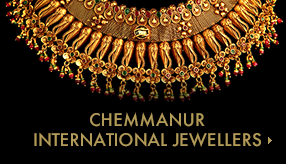 Chemmannur International has a rich, variegated, multi-splendered legacy. Having started way back in 1863 as a small shop at Varanthirappilly, Trichur, it cruised along to become a world renowned brand under the visionary leadership of charismatic, inimitable Dr.Boby Devassikutty Chemmannur, it's Chairman. Boby with his innate sense to gauge the mood of the public, their likes and desires garnered the finest craftsmen from around the country to create the latest customer-oriented designs, by redefining the imagination of the public. He knew very well that changing trends through time frame is the 'manthra' of success. To fortify this belief he started a manufacturing unit at Trichur with the finest infrastructure; the result was that he could bring down the cost of manufacture to a minimum and the gain was for the buyers getting back their moneys worth.The company got the trust reposed in them by the buyers. The relentless pursuit for perfection brought along with it the honor; it was one of the proudest moment for the organization when it was accorded with ISO Certification for Quality Management with the distinction of the first jewellery in the world to receive the same. This was followed with BIS Certification for 'Purity'. Through innovative business opportunities meant for the customers, the group acquired the trust of the people. Any project launched by Chemmannur Group has the footprint of the Chairman, his noble vision, an empathetic altruistic concern for the poor and sidelined. “If we open up a new branch, simultaneously we will be building a house for the needy and the hapless”. Be the global leader in gold & diamond retailing. Redefine gold & diamond industry according to the changing market trends. Generate a lot of employment opportunities for the youth of India and uplift their living standards. “For every branch we open, we build a home for the destitute and the poor. We hope the good hearted people will be motivated to do some equally good thing for the needy and poor”. “Within the next 15 years we will be opening up 500 branches globally correspondingly we will construct 500 poor homes”. Mission delieneated for the company “Generate as much jobs as possible by bringing out opportunities. To quote Chairman's words--”no orphan should be walking along the street. There must be someone over there to share and give love to these wretched people living there” The company is propelled on the foundation of these words.